Last week, Pascale and her daughter from @littlemonkeys.melb headed to the media preview of PAW Patrol Live! 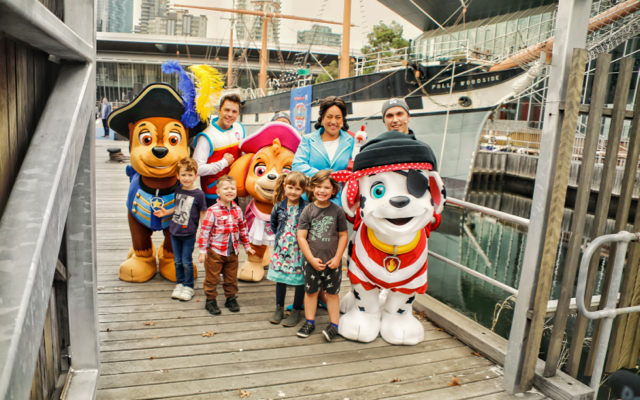 "The Great Pirate Adventure" on behalf of Busy City Kids where they enjoyed songs from the upcoming show and met the Paw Patrol crew at Polly Woodside in Melbourne! In PAW Patrol Live! "The Great Pirate Adventure" Mayor Goodway is getting everything shipshape for a big Pirate Day celebration in Adventure Bay. When Cap’n Turbot falls into a dark and mysterious cavern, it’s PAW Patrol to the rescue! The Pups save Cap'n Turbot and discover a secret pirate treasure map that leads them on an epic adventure. No job is too big, no pirate pup is too small! PAW Patrol Live! "The Great Pirate Adventure" tour dates are out now and shows start next weekend! To celebrate the launch of Paw Patrol Live! "The Great Pirate Adventure", we are giving away 1 x family pass to the Monday 11th of June 2018 Melbourne show at 1pm valued at $149.90! To enter, head to our Facebook page tonight Thursday 10th of May from 7pm - good luck! Entries are now open and close next Tuesday 15th May at 5pm AEST. We experienced a technical glitch with our giveaway on the blog so have removed the giveaway here, please head to our Facebook page tonight to enter - our apologies. For more information on PAW Patrol Live! "The Great Pirate Adventure" and ticket info, head to this website.